Since the volcanic eruption we have moved to Portland OR, where we are now managing the EcoFeminist Community Web Portfolio. Virtual Volunteer. No need to travel! You can volunteer from where you are! As an ecofeminist community, Hedonisia has focused on female empowerment through our policies, practices and web projects. 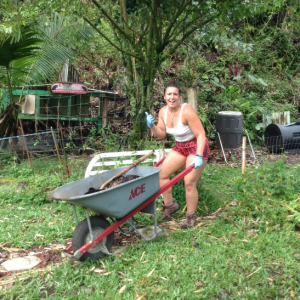 We emphasize that living in the jungle and learning self-reliance and stoicism can be very empowering for women who realize they can do a lot for themselves without having to rely on men! The natural exposure you have while living in the Hawaiian rain forest will help you sharpen many skills, including some you may not even know you possess! Eco-feminism draws connections between the feminist and environmental movements. It equates the treatment of women on the planet with the treatment of Mother Earth. It also references the fact that women’s work in the world is traditionally more closely connected to the planet. At Hedonisia, we believe the best method of learning is through doing, and you get the chance to do a whole lot! Many women report how surprised at how multifaceted and handy they are. Identifying your strengths is one of the most empowering things you can do. It is not feminist to ‘coddle’ a female with only gentle feedback. We help you with feedback as you settle into your volunteer or intern life. With our Jungle Queen approach, women tend to become stronger when allowed the opportunity to be challenged by real jungle and honest feedback! This is why many women have told us they choose to volunteer, intern or simply be a guest in our little rainforest Hawaiian community! Female Travelers in Hawaii. We try to address the needs and concerns of females who are traveling alone or with other women to Hawaii. Consent Culture Community. Guidelines and policies we developed for a fun, harmonious and safe community! Jungle Queens! We give women the tools and structure to become empowered physically, intellectually, creatively and in nature at our rainforest community! Male Feminists! We welcome male feminists and guys who are supportive of empowered females into any of our programs! Portfolio of EcoFeminist Entrepreneur web projects. This is a core part of our community that volunteers and interns can work on as part of their duties.